Depending on the type of design the system SP only allows radial expansion up to tolerance class IT11. To bridge larger tolerances, system SG is used. 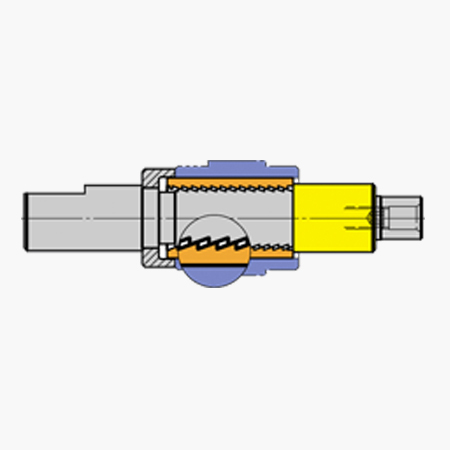 This is a slitted clamping bush with a special buttress thread. With this thread the bush is screwed onto the body. By applying an axial force the clamping bush moves in direction of the force. Due to the thread angle there is also a radial expansion. The workpiece is being clamped. The axial component, which has an effect on the workpiece, increases the transferable torque and the stiffness of the clamping process. Consequently the workpiece is safely clamped even if it is machined with a large depth of cut.